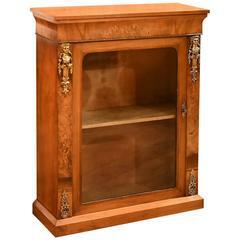 Floral crest cabinet, Netherlands, circa 1850. Constructed in pine. Beautifully patinated form in original blue-grey paint includes elegant detailing throughout. Wall-mounted cabinet, France, circa 1950. With a single sliding door and black painted metal supports. 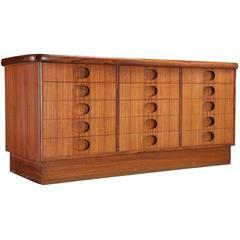 Modern Danish Cabinet, Denmark, circa 1960 With a beautiful grain and 15 drawers with oval cutout pulls. Ebonised Display Cabinet, England, circa 1920 Bow fronted case with brass hardware and adjustable glass shelves. Ebonized display cabinet, England, circa 1920 Three-door shop fitting display with mirrored back and four glass shelves. 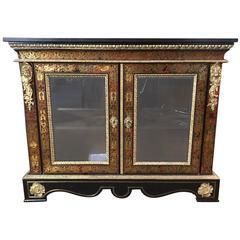 French antique Boulle vitrine cabinet. Wood is decorated with inlaid brass and bronze details. Inside there are wood shelves. Two doors with glass. Good condition, renovated. Fristho elegant rosewood cabinet with fine brass door handles, Netherlands, 1960s.